Lil' Bits "Lakeshore Cottage" leaves you awash in even more clustered elements to create with when crafting your scrapbooking layouts, mini albums and cards. 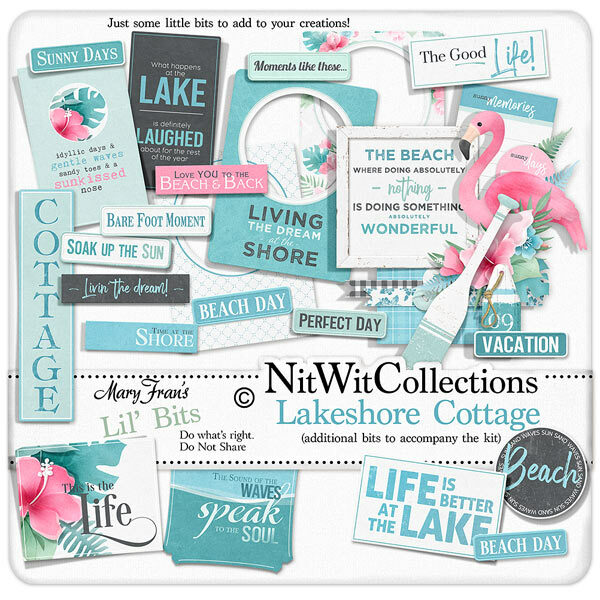 Don't miss out on these digital elements as they are not included in the FQB "Lakeshore Cottage" Collection so please don't miss out on owning and creating with these elements! 1 Cluster with the flamingo, sign, flowers and oar....the perfect main element to begin your creative process! 1 Frame - "Living the Dream at the Shore"
1 Frame - "Beach Day"
1 Vintage label - "Cottage"
1 Label - "The Sound of the Waves...."
1 Floral Label - "This is the Life"
1 Label - "The Good Life"
1 Label - "Life is Better at the Lake"
1 Label - "Idyllic Days and Gentle Waves...."
1 Label - "What Happens at the Lake....."
1 Phrase label - "Love You To...."
1 Phrase label - "Time at the Shore"
1 Phrase label - "Livin' the Dream!" 1 Sticker - "Sun, Sand, Waves, Beach"